We received this email from M-A student Karina Torres Maldonado: “Last night a group of Menlo-Atherton High School students, including myself, attended the Associate Justice of the Supreme Court Sonia Sotomayor’s book signing event, hosted by Menlo Park bookstore Kepler’s. Many of us thought she was such an inspiring and successful woman and were extremely grateful to have had such an opportunity to meet her. My photography teacher, Mrs. Snow, thought that it would be a great idea to share a few of the photographs I captured at the event with InMenlo.” We agree with Mrs. Snow and were appreciative of Karina’s initiative, so picked two to post on InMenlo. Karina was among a group of top Latina juniors and seniors at M-A that attended the event, with tickets supplied by the PTA. “I was admitted into the event at the last minute, thanks to an extra ticket supplied by [M-A bilingual resource teacher] Mr Ready,” emailed Karina when asked for more details. “I was truly grateful to have been chosen. 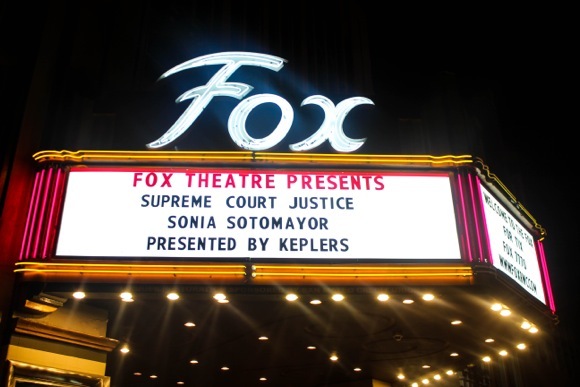 I knew so little about Sonia Sotomayor going into the event, but exited knowing so much about her personal life and her successful career as an Associate Justice of the Supreme Court of the United States. She is the first Latina woman to achieve this and for that she is such an influential and inspiring icon to the Latina community.